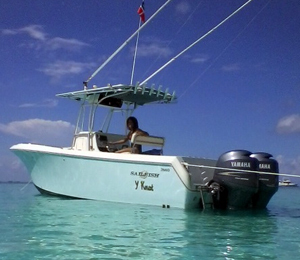 Head out to the shallow waters off the coast of Nassau, Bahamas with the Y-Knot. The Y Knot is a 26-foot Sailfish boat that is ideal for shallow water fishing such as Reef Fishing. The islands of the Bahamas are in very close proximity to a large coral reef ecosystem that is home to hundreds of unique coral species as well as dozens of fish species. Fishing at the coral reef allows you to go after such reef species as grouper and jack crevalles. Reef fishing is different than offshore fishing, but just as rewarding. This is a calmer, more laid back type of fishing excursion. And you need a small boat such as the Y Knot for a successful reef fishing trip. If you have novice anglers in your group, or even some young ones that are interested in fishing, a reef fishing trip is the perfect introduction to Bahamas fishing! Plus, these reef fishing trips are very affordable! The Y Knot is also now fully equipped to run offshore deep sea fishing trips! This boat is easily our most affordable because of its smaller size, so if you are looking to go on either a deep sea fishing trip or a reef fishing trip and want to save a little bit, then the Y Knot might just be the perfect Bahamas fishing vessel for you. We run fishing trips throughout the year, as these waters are teeming with marine life during any season. We do not really have a "winter" here in the Bahamas, so the waters stay full of life winter, summer, fall and spring. The Y Knot is the perfect trip for groups of 5 or less. The boat features comfortable seating and twin 150 Yamaha engines. Our team is made up of professional and highly experienced Nassau natives. All fishing gear, licenses, and equipment are included with your price. I have been to the Bahamas many times, but Y Knot - 26' Sailfish is one of my favorite trips! It includes everything that everyone should do here. As a Bahamas veteran, I can say only the best about this experience!